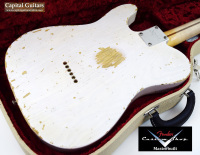 Offered here is a fabulous Fender Custom Shop Heavy Relic Nocaster by Masterbuilder Greg Fessler. 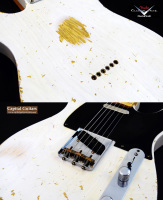 Built in 2008, this Tele has: a 2-piece Ash body with a heavily aged white blonde nitrocellulose lacquer finish and a total weight of just 7.0 pounds; a large U-shaped Maple neck with depth measurements of .990" all the way up the neck with most of the finish removed for a smooth well-played feel; a Maple fretboard with 9.5" radius, medium/jumbo fret wire and a 1.625" bone nut; and for electronics, Fender CS Nocaster single coils with volume, tone, 3-way switch and modern wiring. 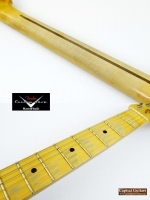 For lovers of big-necked, 50's style Telecasters, this guitar has all you could ask for. 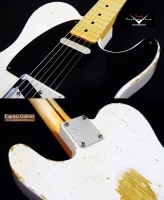 This guitar has the look, feel and sound of a heavily-played vintage Tele, but has much improved playability thanks to it's modern specs and Masterbuilt precision. 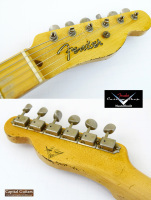 The tone is incredibly authentic too thanks to the vintage output Nocaster pickups. Listen to the provided sound sample and I think you will agree that it has great Tele twang without head-splitting trebles. Based on the fine condition of the medium/jumbo frets, I must assume this guitar has seen only limited play. It comes in a mint G&G thermometer case with the certificate of authenticity, the build sheet and the accessories shown. New Masterbuilt Heavy Relic Telecasters liked this one were offered at the recent NAMM show for $7K. Get this lightly played example for quite a bit less. 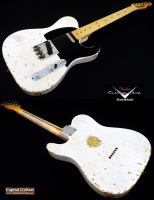 It is hard for me to imagine a finer vintage style Tele than this beautiful Masterbuilt Nocaster. Make this beauty yours today!